I have a slight obsession with tall buildings, and today the world's newly crowned tallest structure was officially inaugurated in Dubai. 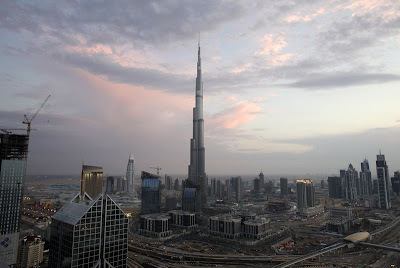 How high exactly had been a closely guarded secret but the Burj Dubai, which was surprisingly renamed the Burj Khalifa was revealed to be 828m (2,716ft) high, far taller than the previous record holder, Taipei 101. Reaching over half a mile in the sky the hotel, luxury residential homes and office building is twice the height of the Trump Tower in Chicago, a skyscraper I blogged on regularly since it was a hole in the ground opposite the apartment I used to once live in. Known as the Burj Dubai throughout it's construction, the tower was renamed after the leader of Dubai's oil-rich neighbour, Abu Dhabi and the recent sponsor of Dubai's very significant overdraft. When I was in Dubai in 2005 we took a trip to the site where the Burj Khalifa now stands and tried to imagine it's potential awe. To be honest it was hard to imagine the future of Dubai at all with a desert full of cranes and construction sites. Certainly it was easy to get wrapped up in the hype, glossy sales brochures and man-made islands but it wasn't difficult envisage the Sheikh's plan falling down either like, well like a gigantic pile of building blocks. Work began on the Burj Dubai in 2004 and continued rapidly. In 2005 we were told that new floors were being added almost every three days, reflecting Dubai's raging push to reshape itself over a few years from a small-time desert outpost into a cosmopolitan urban giant packed with skyscrapers. Today of course it is a different story and from the photos I have seen of the finished Burj Khalifa the surrounding area of soulless part built office towers and sprawling residential developments are sorry excuses of what might have been. At one point some apartments in the Burj Dubai were selling for more than $1,900 per square foot, they are now on a thoroughly depressed market for half of that as Dubai teeters on the edge of defaulting on it's vast debt and many buyers who jumped the gun to own a slice of the tallest structure in the world are left counting their losses. Designed by Chicago firm Skidmore, Owings & Merrill the building dwarfs both the world's previous tallest building, the 1,666 feet tall Tower 101 in Taipei, and the 2,063 feet KVLY-TV mast in North Dakota, the tallest man-made structure. It is so high, the temperature is said to be 10C cooler at the zenith than at the base. Nonetheless ignoring the rest of the city and it's problems for a minute the pictures of the (not yet totally completed) Burj Khalifa look stunning, the building reminding me of a giant rocket launch pad. The ascending steel spires said to bridge the gap between Islamic tradition and ultra-modern western architecture. After our visit in 2005 we vowed to return one day to Dubai to see how it has changed and despite it's financial problems it is still a promise I'd like to keep.